The Center for Health and the Global Environment has developed one graduate course and one undergraduate course focused on climate change and health. We are also developing a certificate program in climate and health. Scroll down for more information. Interested in climate change policy and international negotiations? 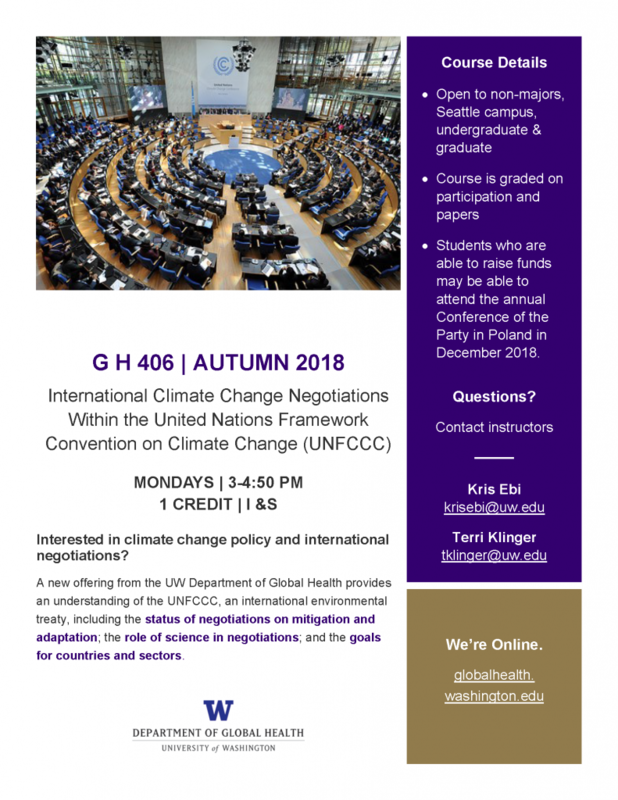 A new offering from the UW Department of Global Health provides an understanding of the UNFCCC, an international environmental treaty, including the status of negotiations on mitigation and adaptation; the role of science in negotiations; and the goals for countries and sectors. Climate change is likely to be an increasing public health challenge this century. The current and projected human health consequences of climate change are diverse and wide-ranging, potentially altering the burden of any health outcome sensitive to weather or climate. Students in this course will gain foundational knowledge in the health effects of climate change, health benefits of mitigation activities, adaptation needs and strategies, and methods for quantifying climate change health effects and mitigation co-benefits. The world has entered a new era: the Anthropocene. Humans are the primary drivers of global environmental changes that are changing the planet on the scale of geological forces. Global environmental changes include climate change, ozone depletion, biodiversity loss, nitrogen fertilization, and ocean acidification. Students will be introduced to these changes and their consequences for human health and well-being, with a focus on climate change and its consequences. Climate variability and change are affecting morbidity and mortality from extreme weather and climate events, and from changes in air quality arising from changing concentrations of ozone, particulate matter, or aeroallergens. Altering weather patterns and sea level rise also may facilitate changes in the geographic range, seasonality, and incidence of selected infectious diseases in some regions, such as malaria moving into highland areas in parts of sub-Saharan Africa. Changes in water availability and agricultural productivity could affect undernutrition, particularly in parts of Asia and Africa. 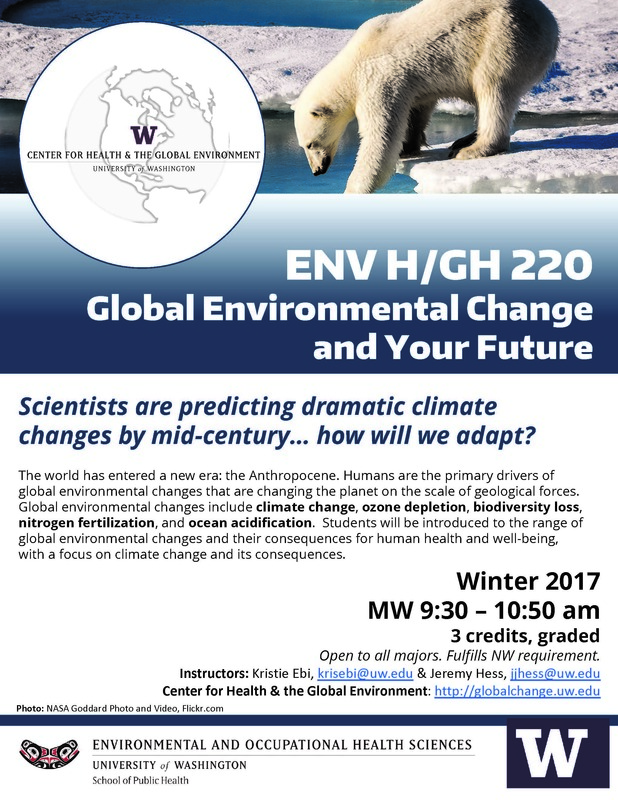 Students will gain foundational knowledge in the health effects of global environmental changes, particularly climate change, benefits of mitigation activities and adaptation needs and strategies. 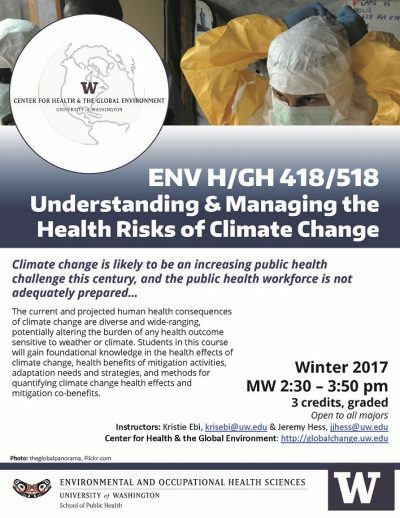 The Graduate Certificate in Climate Change and Health (GCeCCH) certificate program is open to currently-matriculated students in any UW graduate program. The curriculum includes one required three-credit graduate course in climate change and health and one required three-credit graduate course in climate science; at least two electives outside the student’s primary discipline; and a five-credit Capstone Experience tailored to the student’s interests. The required core courses provide an overview of climate change from the perspectives of Earth science and public health, health issues associated with climate change, relevant methods in health and other sciences, and an introduction to important perspectives from other disciplines. 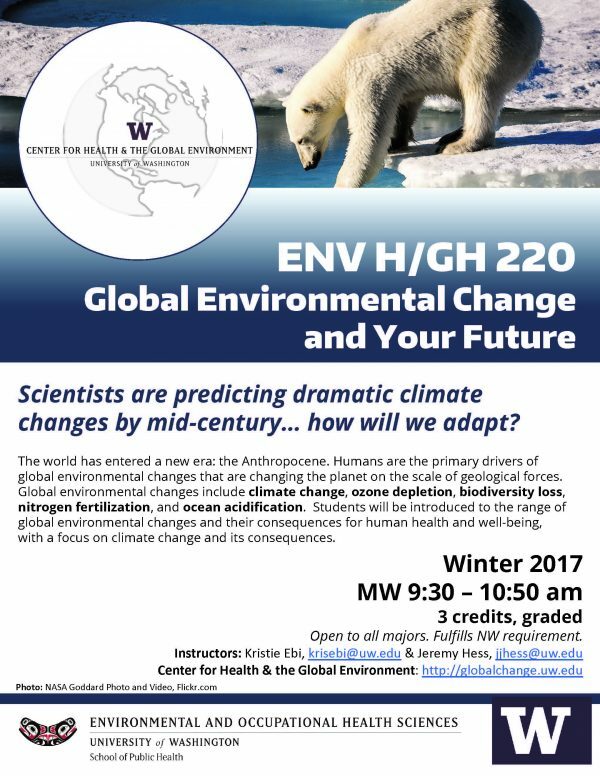 The electives include courses from a wide range of other disciplines at UW that provide relevant complementary perspectives, including those from Earth and atmospheric sciences, geography, policy, social work, life and environmental sciences, the built environment, and other areas. The Capstone Experience will provide a mentored opportunity to explore a climate and health topic more deeply and experience an interdisciplinary approach to the characterization or management of a climate and health concern.